Poor taste is a something easy to achieve on screen, but difficult to do truly artfully. Beyond the work of John Waters (who has made bad taste his raison d'être), one would be hard pressed to find a better example of the creative pinnacle of being gleefully foul than Peter Jackson's "puppets gone to Hell" gross-out comedy, Meet the Feebles. 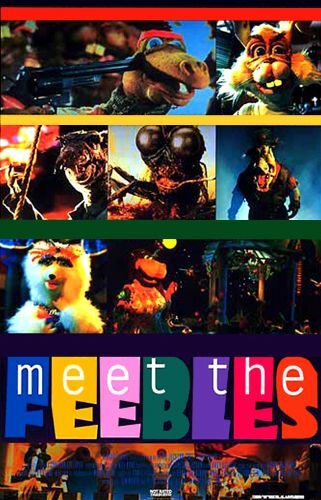 While Meet the Feebles has enough gory violence, icky bodily substances, cross-species sexual contact, foul language, and unapologetic criminality to appall most ordinary audiences (and, as legend has it, to cause Jim Henson's organization to consider possible legal action), the film is far too imaginative and intelligent to sit comfortably alongside, say, Shallow Hal or American Pie. Wynard the Frog's Vietnam flashbacks are both wickedly funny and more politically astute than anything in The Deer Hunter, Harry the Rabbit's extended bout with a sexually transmitted disease is a more honest and gut-wrenching depiction of AIDS than you'll see in most major studio films concerning the subject, and the numerous sexual peccadilloes and flagrant infidelities go past soap-opera level into something that approximates real human anger and anguish, albeit on a broadly comic level. And the sheer scale of the film goes beyond the parameters of a simple bad joke into something that inspires a sort of grimy awe. If you've read this far, you've probably already figured out that Meet the Feebles is not for everyone, but it's a superb slice of wickedly black satire for folks who like their humor to burn a bit on the way down.